I love podcasts. I listen to them during my commute and while doing chores around the house. They are a great form of entertainment for times when your hands and eyes are busy but your brain has nothing to do. Apple has a built-in Podcasts app that makes it easy to play podcasts on iPhone, iPad, iPod Touch, or Apple TV. One problem with subscribing to podcasts is that if you accumulate a large number of downloaded podcasts, they can start to take up some serious memory space. There are two main ways to stop syncing podcast episodes to conserve memory: limit the number of podcasts that will automatically download to your device or stop automatically syncing your podcasts altogether. If you chose the later, you can still play your podcasts, but you will have to download them manually if you want to listen to them offline. Both methods are described below. If you need to free up memory space but do not want to change how you are syncing your podcast episodes, you can manually delete episodes. Read my tutorial on how to do that here. Note: You can set a default for these settings across all your podcasts by going to Settings>Podcasts or follow the steps below to set a different limit for each podcast. 2.From My Podcasts, tap one of your podcasts to open it. Tap Settings at the top of your screen- you may need to scroll up a bit to see it. 3.There are two memory-saving settings to be changed from this screen. First, make sure that Delete Played Episodes is turned on. 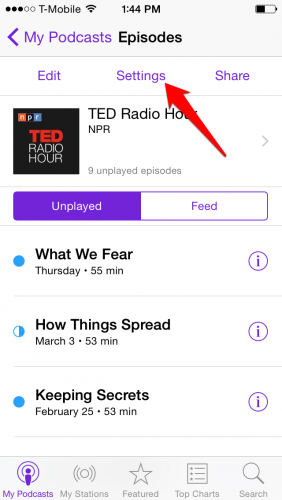 This will remove podcasts from your device 24 hours after you have listened to them. Next, go to Limit Episodes. 4.Choose how many episodes of this podcast you want to keep on your phone. You can choose a set number of the most recent episodes or specify new podcasts from the past Day, Week, or Month. 1.From your home screen, go to Settings>Podcasts. 2.Turn off Sync Podcasts. This will stop podcasts from automatically downloading, but new episodes will still be shown in My Podcasts for you to play over wifi or download them for offline listening by tapping on the download icon.